Yawning Tiger, 1902-06; cast 1919-21. Bronze; 8 3/8 x 28 1/3 x 7 ¾ in. | 21.27 x 71.76 x 19.69 cm. Collection Syracuse University Art Galleries, gift of Linda Witherill (1993.039). Photo courtesy of Syracuse University Art Galleries. Anna Hyatt Huntington loved big cats. Beginning with her first cat sculptures in 1898, she created hundreds of jaguars, leopards, lions, and tigers in all shapes and sizes. In 1902, after settling in New York, AHH spent much time at the New York Zoological Society, today’s Bronx Zoo. There she modeled a variety of animals, from bison and bears to llamas and lions. She insisted throughout her career on the necessity of modeling animal subjects from life, rather than studying them in an academic setting. She explained, “I never studied with any one person. I worked on my own. I adored animals, so I studied in zoos. I spent years in zoos, especially the Bronx Zoo, just to study the animals.”6 Writers have long employed the trope of the naturally talented artist who from a young age demonstrated genius. Lorenzo Ghiberti framed Giotto Bondone this way, as Giorgio Vasari did Michelangelo. Then journalist Anna Coleman Ladd made this connection with legendary Italian artists explicit in 1912 when she wrote, “Anna Hyatt was little more than a baby when, like Giotto, she followed and drew the sheep on a farm, and knew by heart the points and names of a hundred thoroughbreds from pictures, before she had learned to read.”7 Although AHH was blessed with visual acuity, she studied, albeit briefly, with Henry Hudson Kitson in Boston and Hermon Atkins MacNeil and Gutzon Borglum at the Art Students League in New York. During her period of most intense work at the New York Zoological Society, she and her mother boarded nearby in the Bronx. AHH recalled “doing a lot of wild animal studies in the studio provided for artists in the Lion building. We [the artists] had lockers there to keep our clay models so as not to have to carry them back and forth.” She continued: “I remember having one small model of a tiger completely crushed that I had just finished and was carrying home in a street car, it was resting on my lap when a large woman lost her balance by a jerk of the car when walking in the aisle and her hand came down on my model smack, the model was flattened and she shrieked thinking the model was alive.”8 AHH made rough sketches and miniature clay models while observing the animals first-hand. She worked small lumps of plasterline on modeling tablets, transforming clay masses into sketches of wild beasts. One ferocious animal, in particular, captured AHH’s attention: the celebrity Paraguayan jaguar Señor Lopez, who served as a source of inspiration over nearly four decades. A newspaper article relates the “unusual story” of AHH’s modeling of Señor Lopez for Reaching Jaguar at the Bronx Zoo. “This animal, a magnificent specimen owned by the Bronx Zoo, was so ferocious that even his keepers were unable to make friends with him. So violent was his temper that he killed a beautiful mate the instant she was admitted to his cage. It was the animal’s habit once or twice each day to climb upon a shelf-like ledge of rock within his enclosure, then, turning slowly, to begin the descent. Every day for two months Miss Hyatt sat before his cage, waiting with infinite patience for this moment when working rapidly she would model some muscle or portion of his lithe body in clay. As the days passed the animal began to show signs of wishing to make friends with this gentle voiced woman. Finally, to the chagrin and admiration of the keepers, at the end of two months the jaguar would lie close to the bars to be scratched, muttering friendly jungle talk the while.”10 As AHH’s sketchbook reveals, she often studied Señor Lopez, examining the curve of his backbone, his arched body, sinuous form, and intensity of facial expression. Such close and repeated inspection allowed her to convey the animal’s ferocity and feral athleticism, poised to attack at any instant. After forging her own “American” identity as an artist, AHH spent several years working in Europe. Before traveling, she claimed: “It is unnecessary for a sculptor to go abroad to study today. We have schools and masters in this country who can give much. Art centres that are really art centres of the serious kind have been formed in the last few years. The flighty student life has little place in the life of those who really wish to do something. There are museums here with fine examples of the antique. There is in fact, every facility for study. Why go abroad?”23 But, abroad she went in 1906. She occupied the former studio in Auvers-sur-Oise near Paris of Charles-François Daubigny, a 19th-century landscape painter associated with the Barbizon school. (“Think of working in a studio permeated by the sprit of Daubigny!” Daniel Chester French wrote to AHH. )24 Here, she worked on monumentalizing her small models created at the New York Zoological Society. One visitor to her studio in 1907 reported: “Two life-sized jaguars, recently cast in plaster and designed for a gate entrance, meet the eye first, not so much because of their size as their virility. The muscles in the shoulder of the foreleg was a close subtle study and could only be obtained by patient waiting and the few instants that the creature could be made to hold that position by the threatening gestures of the keeper.”25 Jaguar and Reaching Jaguar were the first two life-size pieces that AHH created. In 1935, in preparation for her upcoming retrospective at the American Academy of Arts and Letters, AHH ordered a fifth pair of jaguars to be carved by Baillie.35 Initially placed on either side of the entrance to the Academy at Audubon Terrance, these Tennessee limestone jaguars greeted the entering public as they passed beneath a neoclassical façade with the words, “ALL PASSES ART ALONE UNTIRING STAYS TO US.” When the exhibition closed in the summer of 1937, Jaguar and Reaching Jaguar were transported to the Bronx Zoo, the site of their inspiration. AHH’s ongoing relationship with these wild animals seems in part connected to the idea of “the vanishing West.” In his highly influential 1893 lecture, “The Significance of the Frontier in American History,” the historian Frederick Jackson Turner proposed that unique elements of American identity emerged in the West.36 There, ideas of democracy, social and economic mobility, and individual liberty evolved. As the frontier closed, these defining qualities of American culture had to be reformulated—brought east and reintegrated into rapidly expanding urban metropolis. Untamed nature arrived in eastern cities in the form of zoological parks and natural history museums, where man’s relationship with beasts began to change. Wild animals, displayed to thousands of curious viewers, spoke to man’s taming of nature within the framework of American identity. 1 "Alpheus Hyatt." In Dictionary of American Biography, edited by Dumas Malone. New York: Scribner, 1956. V: 446-47. 2 "Sculptress Works Speak for 89 Years of Skill." Hartford Times, 13 April 1965. 3 Letter quoted in Christ, Ronald. "Anna Hyatt Huntington." SITES, 1986, 39-40. 4"Sculptress Works Speak for 89 Years of Skill." Hartford Times, 13 April 1965. 5 "Anna Hyatt Huntington." American Art. 8, no. 1 (Winter 1994): 90. 6 Tucker, Jean. "The Art of Work." The Courant Magazine, 24 May 1964, 6. 7 Ladd, Anna Coleman. "Anna V. Hyatt--Animal Sculptor." Art and Progress 4, no. 1 (November 1912), 775. 8 Undated typed sheet entitled “Studios.” Anna Hyatt Huntington Papers, Special Collections Research Center, Syracuse University Libraries. 9 "Woman Sculptor and Bison in the Bronx Zoo Exchange Confidences." New York Times, 31 December 1905. 10Wells, Corinne Updegraff. "Personality Flashlights--Women in Field of Art--Fashion and Fairy Stories." The Sun, 29 December 1921, 12. 11 A 1903 exhibition is mentioned in De Kay, Charles. "Exhibition by the Woman's Art Club." New York Times, 6 December 1903, 7. A 1905 exhibition is mentioned in "Woman Sculptor and Bison in the Bronx Zoo Exchange Confidences." New York Times, 31 December 1905. For a review of a 1912 exhibition of AHH’s work held by Gorham, see Ladd, Anna Coleman. "Anna V. Hyatt--Animal Sculptor." Art and Progress 4, no. 1 (November 1912): 773-76. On a 1913 Gorham exhibition, see Du Bois, Guy Pène. "The Domain of the Woman Sculptor." Vogue, 1 August 1913, 45, 68. On a 1914 exhibition, see "Miss Anna Vaughn Hyatt's Sculpture at the Gorham." The Brooklyn Daily Eagle, 24 January 1914, 7. 12 On 31 January 1906, Gorham sold the first copies of Lioness and Cub, just under six inches long. Gorham Manufacturing Company, Bronze Division records, [ca. 1905-1978]. Owned by Brown University John Hay Library; microfilmed by the Archives of American Art, Smithsonian Institution. 3680-3681. However, a copy of Lioness and Cub was included in an exhibition at the National Arts Club in 1903, meaning the group must have been initially modeled before then. De Kay, Charles. "Exhibition by the Woman's Art Club." New York Times, 6 December 1903, 7. 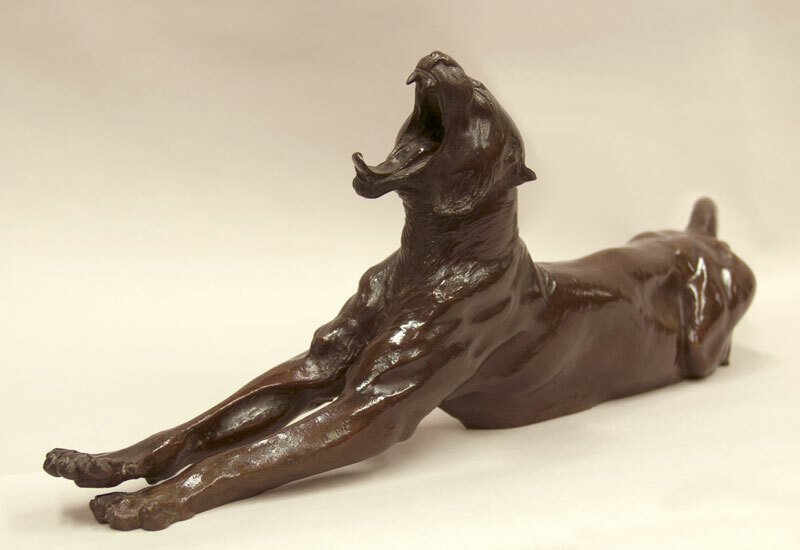 13 Gorham sold this immensely popular statuette, sometimes called Panther Reaching, from November 1906 until June 1936; however, at least one copy must have been cast by 1905 as it was on display at Gorham while other copies were being made. "Woman Sculptor and Bison in the Bronx Zoo Exchange Confidences." New York Times, 31 December 1905. AHH’s sister purchased the 200th1926. Examples of this work may be found in The Hyde Collection, Glens Falls, New York (1971.96), The New Britain Museum of American Art, New Britain, Connecticut (#162), and The Newark Museum of Art, Newark, Newark, New Jersey (#43). Gorham Manufacturing Company, Bronze Division records, [ca. 1905-1978]. Owned by Brown University John Hay Library; microfilmed by the Archives of American Art, Smithsonian Institution. 3680-3681. 14 First sold on 13 December 1910, Tiger Group may be related to AHH’s later Tigers Sleeping, c. 1911-22. Gorham Manufacturing Company, Bronze Division records, [ca. 1905-1978]. Owned by Brown University John Hay Library; microfilmed by the Archives of American Art, Smithsonian Institution. 3680-3681. 15 AHH purchased numbers 16, 17, 18, and 19 of Lion and Lioness Group, first sold in February 1911. Gorham Manufacturing Company, Bronze Division records, [ca. 1905-1978]. Owned by Brown University John Hay Library; microfilmed by the Archives of American Art, Smithsonian Institution. 3680-3681. 16 The tallest of the diminutive versions of Reaching Jaguar (sometimes referred to as Reaching Panther), Q477 stands nine inches high and was first sold by Gorham on 21 December 1914. Gorham Manufacturing Company, Bronze Division records, [ca. 1905-1978]. Owned by Brown University John Hay Library; microfilmed by the Archives of American Art, Smithsonian Institution. 3680-3681. 17 This 13 ¼” long version of Yawning Tiger is closely related to Yawning Tiger (Q509), included in the exhibition (cat. no. 2). The former is smaller and almost always placed on an additional base. Gorham Manufacturing Company, Bronze Division records, [ca. 1905-1978]. Owned by Brown University John Hay Library; microfilmed by the Archives of American Art, Smithsonian Institution. 3680-3681. 18 First sold in 1917, the tail on Q493 (sometimes called Panther) is noticeably more curled than in Q38 and Q477. Gorham Manufacturing Company, Bronze Division records, [ca. 1905-1978]. Owned by Brown University John Hay Library; microfilmed by the Archives of American Art, Smithsonian Institution. 3680-3681. 19 The New Britain Museum of American Art, New Britain, Connecticut (#2), and The Newark Museum of Art, Newark, Newark, New Jersey (#20) both own versions of Q494, sometimes called Panther or Jaguar Looking Up and first sold in 1917. Gorham Manufacturing Company, Bronze Division records, [ca. 1905-1978]. Owned by Brown University John Hay Library; microfilmed by the Archives of American Art, Smithsonian Institution. 3680-3681. 20 Goddess, Heroine, Beast: Anna Hyatt Huntington’s New York Sculpture, 1902-1936. cat. no. 2. 21 Gorham manufactured “Q-number” bronzes when the company either owned the reproduction rights or the artist received royalties on a sale by sale basis. When the company cast a work directly for a client or artist, the bronzes were labeled on an individual basis according to a “Q-letter” system ” (i.e. QVW) on an individual basis. Gorham Manufacturing Company, Bronze Division records, [ca. 1905-1978]. Owned by Brown University John Hay Library; microfilmed by the Archives of American Art, Smithsonian Institution. 3680-3681. 22Cortissoz, Royal. "Recent Works by Two American Sculptors." New York Tribune, February 1914, D6. 23 "The "New Spirit" in Women's Sculpture." The Syracuse Herald, 25 March 1917. 24 Daniel Chester French to Anna Vaughn Hyatt, 22 August 1907. The Hispanic Society of America Archives. 25 Clipping from The Paris-American, 1907. The Hispanic Society of America Archives..
26 Baschet, Ludovic. Catalogue Illustré Du Salon de 1908. Paris: Bibliothèque des Annales, Société des Artistes Français, 1908. 27 Anna Vaughn Hyatt to Audella Beebe Hyatt, 3 September 1909. The Hispanic Society of American Archives. 28 Leonardo Taft to Anna Vaughn Hyatt, 3 April 1916. The Hispanic Society of America Archives. 29 An announcement in the journal Art and Progress mentions the inclusion of “a full size jaguar to a tortoise paper weight.” Art and Progress. 5, no. 5 (1914): 186. 30Among those women eventually chosen were senator Helen Ring Robinson, writer Edith Wharton, and the president of Bryn Mawr College, Carey Thomas. Craigie, Dorothy. "The Twelve Greatest Living American Women--Who Are They?" The Evening Telegram New York, 11 June 1922, 7. 31Each is signed Anna V. Hyatt on the rock. No foundry mark. Height: Jaguar, 26 in. (66 cm. ); Reaching Jaguar, 43 in. (109.2 cm). Sold at auction by Christie’s. Sale 1249—American Paintings. 18 June 2003, Los Angeles. Lot 70. 32Jaguar, 26.85.2. 28 ½ x 42 x 25 in. (72.4 x 106.7 x 63.5 cm.). Foundry mark: JNO Williams INC. N.Y./1926. Reaching Jaguar, 26.85.1. 48 x 44 22 in. (121.9 x 111.8 x 55.9 cm.). Signed: Anna H. Huntington. Foundry mark: JNO WILLIAMS INC. N.Y./1926. 33No signature or foundry mark on either. Height: Jaguar, 62 in. (155.1 cm); Reaching Jaguar, 64 in. (162.7 cm). "Sculpture by Anna Hyatt Huntington in the Collection of Brookgreen Gardens." Brookgreen Bulletin 3, no. 13 (1983): n.p, entries 5 and 6. 34Jaguar, 1933.0294.000001. 89 ½ x 48 x 27 in; Reaching Jaguar, 1933.0295.000001. 93 x 32 x 26 in. 35See correspondence between Baillie and AHH between 1 February and 21 October 1936. Anna Hyatt Huntington Papers, Special Collections Research Center, Syracuse University Libraries. 36Turner, Frederick Jackson. The Significance of the Frontier in American History. Edited by Harold P. Simonson New York: Ungar, 1963. Anna Hyatt Huntington face to face with her sculpture, Jaguar. Still photo from 1930 film, Sculpture in Stone. Photo courtesy of Anna Hyatt Huntington Papers, Special Collections Research Center, Syracuse University Libraries. [caption: New York Times article published 31 December 1905. Image from artist’s scrapbook, c. 1898-1907. Photo courtesy The Hispanic Society of America. [caption: Page from Anna Hyatt Huntington’s sketchbook. Rapidly sketched, this drawing captures the elongated jaguar’s silhouette and also includes a cursory study of the animal’s facial features. The artist’s use of minimal lines suggests the difficulty in using often-recalcitrant animals as models. Photo courtesy The Hispanic Society of America. Detail from the Anna Hyatt Huntington’s sketchbook. Anna Hyatt Huntington employed drawings for a variety of purposes in her creative process. She carefully renders the jaguar’s head, examining the animal’s features both in profile and straight on. Photo courtesy of The Hispanic Society of America. Detail from Anna Hyatt Huntington’s sketchbook. In this sketch, she seeks to capture the instant of a “leopard leaping for prey.” Photo courtesy The Hispanic Society of America. Jaguar Reaching and Jaguar, modeled 1906-7, cast 1921. Bronze; 43 in. | 109.2 cm high and 26 in. | 66 cm. high, respectively. Both inscribed on the rock: Anna V. Hyatt. Photo courtesy of Christie’s Inc. Photograph of Robert A. Baillie standing between two versions of Anna Hyatt Huntington’s Jaguar during the filming of Sculpture in Stone. Photo courtesy of Anna Hyatt Huntington Papers, Special Collections Research Center, Syracuse University Libraries. Photograph of Jaguar and Reaching Jaguar in front of the American Academy of Arts and Letters’ south facade on Audubon Terrace at 156th Street between Broadway and Riverside Drive, c. 1936-37. (Photo courtesy of Anna Hyatt Huntington Papers, Special Collections Research Center, Syracuse University Libraries. Photograph of Jaguar and Reaching Jaguar on the slope between Fountain Circle and Astor Court upon their installation at the Bronx Zoo in 1937. Photo courtesy of Anna Hyatt Huntington Papers, Special Collections Research Center, Syracuse University Libraries.